Does anybody know anything about this clock? 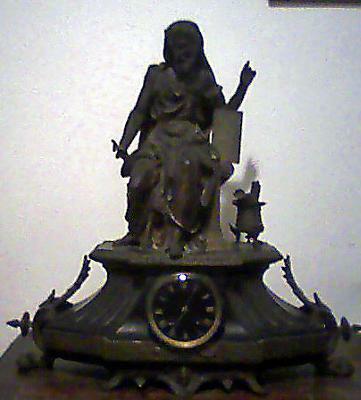 This clock is entirely made out of metal, has a metal sculpture on top of its base that has a woman holding a tablet that says "Les Hommes Illustres". On the side of the base of the sculpture is the word HUZEL, in capital letters. (I believe this is the artist based on my research.) The black face of the clock has two tiny letters "S" and "F". The sculpture detaches from the base of the clock. Can you tell me anything about this clock?